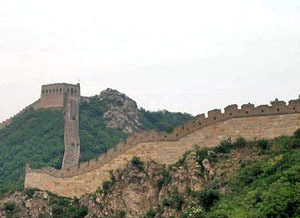 The Great Wall of China was built and maintained between the 5th century B.C. and the 16th century as fortifications to protect China from Mongol tribes invasion. The actual length of the monument was around 6000km long. Petra is the most famous site located on the edge of the Arabian Desert. It is the capital of the Nabataean empire of King Aretas IV (9 B.C. 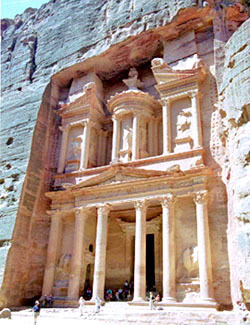 to 40 A.D.) The Petra basin boasts over 800 individual monuments, including buildings, tombs, temples, and arched gateways. Taj Mahal is a mausoleum built by the fifth Muslim Mughal Emperor Shah Jahan. 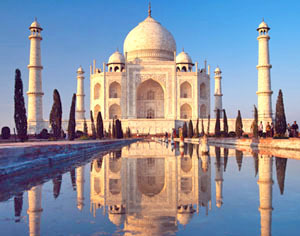 He built it in the memory of his favorite wife, Mumtaz Mahal. It is located in Agra, India. Construction of the mausoleum took twenty thousand workers over twenty years (1632-1648), and an estimated cost of 32 million rupees to complete. The Great Pyramid of Giza is the only remaining wonder from the original Seven Wonders of the World. It is located in Giza Necropolis, not far away from Egypt's capital city, Cairo. The monument was built by Egyptian pharaoh Khufu of the Fourth Dynasty around the year 2560 B.C. Over 100,000 labourers had worked on building the royal tomb for 20 years before it was completed. 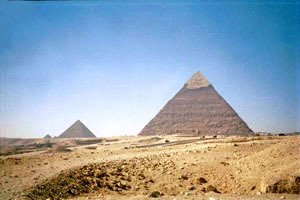 The length of the pyramid is around 230.4m long , and the current height is 138.8m tall. Machu Pichu is a pre-Columbian city constructed around the year 1450 by the Inca Empire and was abandoned less than 100 years later during the Spanish invasion. The ruins are located two thousand feet above the rumbling Urubamba river close to the town of Aguas Calientes. 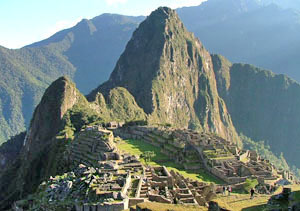 The ruins were discovered in 1911 by Yale archaeologist Hiram Bingham. Angkor Wat is a temple built for built for King Suryavarman II in the early 12th century to honor the Hindu god Vishnu and is a symbolic representation of Hindu cosmology. 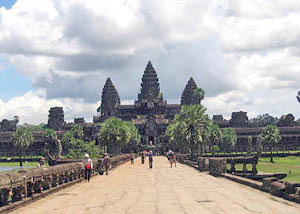 The temples at Angkor are spread out over some 40 miles around the village of Siem Reap. Chichen Itza is a large pre-Columbian archaeological site built by the Maya civilization between 7th and 10th centuries A.D. It is located 75 miles east of Merida, Mexico, close to the resort town of Cancun. It was a large city with a great many inhabitants, distributed around the architectural nucleii. 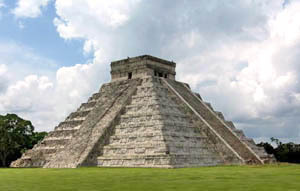 The site is dominated by the grand pyramid of Kukulkan. 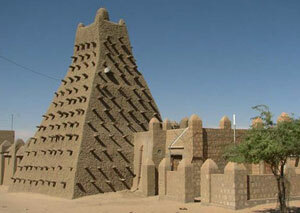 Timbuktu is a prehiostric site located in southern Sahara Desert in the country of Mali. The town was founded in the 12th century by a group of seasonal nomad. It flourished in trade in salt, gold, ivory and slaves. The three mosques, Djingareiber Mosque, Sankore Mosque and Sidi Yehia Mosque, along with surrounding mausoleums and houses were declared a UNESCO World Heritage Site in 1988. 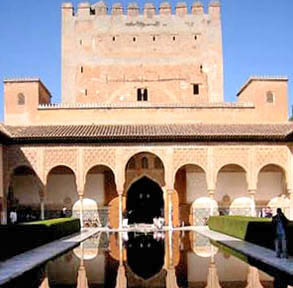 The Alhambra is a palace and fortress complex of the Moorish monarchs of Granada, in southern Spain. It was converted by the first king of the Nasriden, Mohammed I, from a 9th century castle into his own residence. 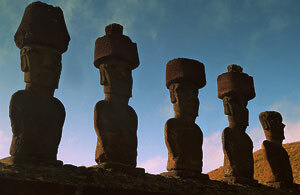 The Easter Island Statues, also known as Moai, are human figures craved from stone blocks on Eastern Island in Chile. They were believed to be built by Polynesian between AD 1200 to 1500. Colosseum of Rome is a giant amphitheatre located in the centre of the city of Rome, Italy. Construction was started by Emperor Vespasian in 72 A.D., and was completed by his son, Titus, in 80 A.D. 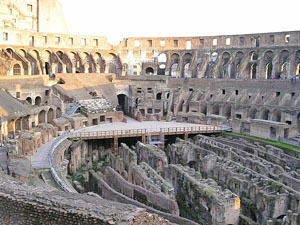 It was used for gladiatorial contests and public spectacles. Stonehenge is a prehistoric monument located in the English county of Wiltshire. 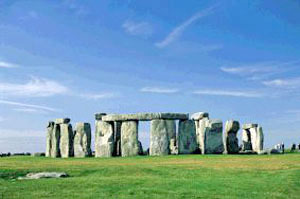 It was believed that it was built 3000 and 1600 B.C. With each stone weighing around 50 tons, it is regarded as a truly amazing feat of engineering. It is not clear who built it, nor why it was built. However, it has been speculated that it was either a temple dedicated to the worship of ancient earth deities, an astronomical observatory or a sacred burial site. Nemrut Dagi National Park is located in eastern Turkey. 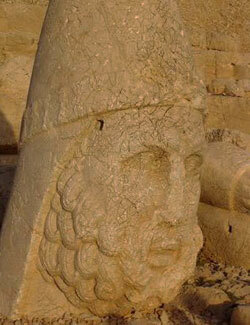 The tomb or the Hierotheseion of Nemrut Dag was built for King Antiochos I of Commagene. There are statues of the gods, the king, an eagle, and a lion made with huge stone blocks weighing up to 9 tonnes each.